New User? Sign Up Forgot Username/Password? Welcome to Official Alumni Module. If you have already registered in this directory and want to edit your profile Click here. And if you are new user and want to create your profile Click here. If you are not existing User then click on New User link. In the registeration form all the Fields are compulsory...(*All fields are compulsory). Now you will get the message Thank you for Registration...! in the form. Now click on Back button for going on Login page. After fill the Username and password click on Login button to enter the Alumni Section. If your Username and/or password are/is wrong then you will get the message like your Login Faild. “Forget Password” link will send password to your email id which you have provided. Copyright All Rights Reserved. 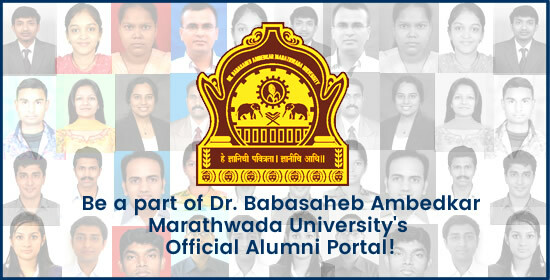 Dr. Babasaheb Ambedkar Marathwada University, Aurangabad.